home One way of monitoring physical activity intensity is to determine whether a person's pulse or heart rate is within the target zone during physical activity. Thus, moderate-intensity physical activity for a 50-year-old person will require that the heart rate remains between 85 and 119 bpm during physical activity. Thus, vigorous-intensity physical activity for a 35-year-old person will require that the heart rate remains between 130 and 157 bpm during physical activity. Generally, to determine whether you are exercising within the heart rate target zone, you must stop exercising briefly to take your pulse. You can take the pulse at the neck, the wrist, or the chest. We recommend the wrist. 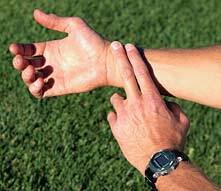 You can feel the radial pulse on the artery of the wrist in line with the thumb. Place the tips of the index and middle fingers over the artery and press lightly. Do not use the thumb. Take a full 60-second count of the heartbeats, or take for 30 seconds and multiply by 2. Start the count on a beat, which is counted as "zero." If this number falls between 85 and 119 bpm in the case of the 50-year-old person, he or she is active within the target range for moderate-intensity activity.